Elliott turned one, and we had his birthday party. Cake, friends, balloons, a fake photobooth, mostly just the friends, filling the house to bursting. I wish we could have invited 70 more people. It was one of the rare moments where I stopped and realized "we are loved. we are treasured. we have people. this is awesome." Thank you, all of you, for making our family work. For validating my need to share and get feedback and show off this little life, with all the ups and downs. It was a good party. 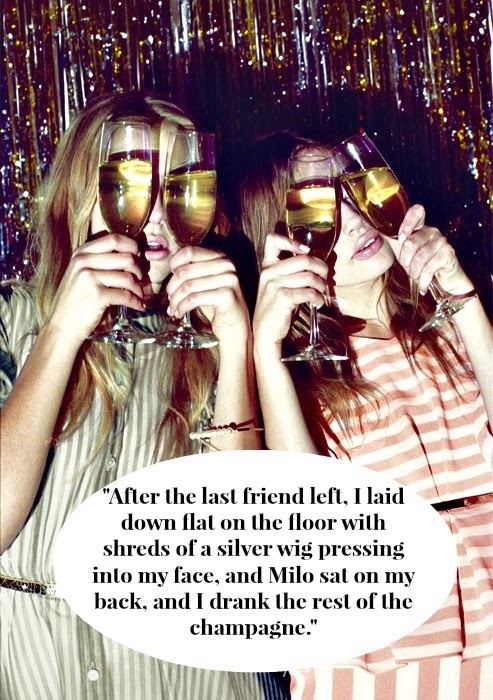 After the last friend left, I laid down flat on the floor with shreds of a silver wig pressing into my face, and Milo sat on my back, and I drank the rest of the champagne. This morning the boys were up early. Like, from 1am on, and when all of us and the cat in the full sized bed wasn't working, I brought the boys out here to play and clean up diapers and watch Megamind, which I really liked but I'm burnt out on it and only exhaustion kept me from fighting for Wreck It Ralph. We had time for the entire movie, some balloon olympics, eggs and fruit, storytime, and cleaning the kitchen. By 7:20 both kids had been given cough syrup and put back to bed. I've lived half a day and it's only 8, and I'm alone in a quiet house. My mind is everywhere. My heart is sore and my brain jumbled, dwelling on a real-life sadness, one of the things that makes it so I don't need to read Jodi Picoult or watch dramatic movies. Real life is sad enough, even heard about from a distance. Work is overwhelming, and I wonder if it's right. If I'm a right fit. If I could move a small step up or down and be more effective. I'm wondering if I could ever make money by writing. The kind of money that sends kids to daycare and puts kale on the table, even if we pick Ramen for Saturday lunch over half the time. There is a big part of me that truly thinks it's selfish to even wonder. I have a job that provides SO MUCH for my family, money and medical care and a predictable schedule and the gift of time. Whether or not I'm fulfilled is a separate matter. 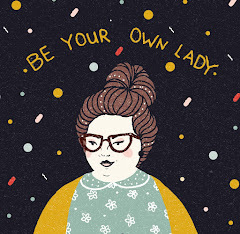 Maybe the first goal is to learn how to fulfill yourself, make yourself happy, get a hobby and get really good and it and shoulder through the work. See it for what it is and look for your fulfillment in the moments before, after, and in between. Count your lucky stars. So that's a tiny corner of my brain right now, a constant beat with "WE NEED YOGURT" and "FIND BABYSITTER FOR MONDAY" thrown in for good measure. Right now I'm going to take advantage of this silence and read, and have more coffee, and make a list of things to get done like any sane person on a Sunday morning. I'm happy, and I'm lucky, and I'm home. I have a feeling that even when I'm old, I'll still remember last night when a pretty song came on Pandora at the end of dinner and I got up and started twirling around the kitchen like a loon. Both boys were laughing so much and Milo started begging to get down and I cut him loose from his booster seat, sure he was going to run for his cars, and he started twirling right next to me, beaming, and then he put his arms up and said, "Me hold you, Mama. Me hold you." And I picked him up and we started twirling and he started saying "Me deence Mama, me deence," and he laid his head on my shoulder and put him arms around my neck and cooked rice was squishing under my feet and my heart was bursting. Elliott watched all this and started whining so loudly and I thought, "You're not hungry, goof, you just ate," so I went over and he put his arms up, too. I put Milo down to unstrap Elliott and Elliott was beaming, now, too, he just wanted in on the fun. I held Elliott on my hip and he was grinning and Milo put his arms up, a bit demanding now, "ME HOLD YOU MA-MA!" so I scooped him up with my right arm and he held on like a monkey to help me and I was holding both boys and somehow that pretty song wasn't quite over yet and I was dancing in my kitchen with both my sons in my arms and they were belly laughing and smiling and letting their little head collapse against my chest. It barely felt real. The song was over and it was bath time and we jumbled into the tiny bathroom, like every night, stripping off clothes and showering the floor with little bits of dinner, Milo running sink water over one of his toys ("Wash!") while I struggled to get Elliott out of his diaper. I was sitting on the closed lid of the toilet with Elliott in my arms and suddenly burst into tears. Milo couldn't hear me over the running water. Elliott giggled with his back to me, and so I let myself have one minute of absolute heartbreak over how much I love these boys. It is a love that breaks hearts. It's a word I don't know. It's 2 minutes of dancing in the kitchen blotting out weeks and months and years of exhaustion and mess. It's falling in love with the mess. It's the sheer terror that anything, anything could happen. Someone could decide (realize?) you don't deserve this heart busting love and it's so scary that so much of what you love about your life is going around, all day and all life, outside your body. But you do it anyway. You never had a choice. The night went on, bath toys were played with and pajamas found and when Ben got home Elliott took a few steps for him, Milo brought him books to read. It was a normal night with folded laundry and packed lunches and chatting with Ben about bills and our weekend plans before falling asleep. But when I woke up again this morning, and slipped out of our bed full to bursting with little boys in footie pajamas, and watched Ben shift to pull the covers up to little chins, I realized I should write down that flash of feeling that real life only lets you get to once in a while. The feeling of terrifying, overwhelming love. The feeling of dancing with my sons in the kitchen. ...happy to be back into our routine. If you follow me on Facebook or Instagram, you know it was getting bad near the end there. We were home for two days (plus the weekend) longer than expected, we were sick and snowed in for the majority of that time, and I was not a gracious mama. The first day back at work, I was giddy, my students were angelic, and when I picked the kids up at daycare, all the babies were grinning and laughing and dancing around with glee. I think most of us are creatures of routine, and we were glowing. ...a LITTLE behind with our word of the year. Moving isn't coming super naturally, which is why it's our word in the first place. This weekend Ben and I started getting closer to agreeing on a location, and we talked about getting in touch with people to take steps to list the house. As far as bodies, I've been to the gym once (see: snow storm, sickness) and have played in the living room more with the kids, but I need to figure out how to get the boys moving more on a typical day. Indoor play places need to be hit, too. ...sweetly sad that Elliott turns one in under a week. My tiny baby is a toddler. I keep thinking about this week a year ago. I remember being stressed about appointments and gestational diabetes and low fluid levels and having no clue how much my life was about to change. We're having a special breakfast for him on Tuesday morning, and a little party in a few weekends. ...proud of Milo's words and communication. Over the past few weeks, I've noticed him really shifting from answering questions or describing his toys to telling us stories about things that happen. When I got home from work last night, Ben was playing trains with the boys in the living room. Milo started telling me about the train situation at daycare, "Beeeg tunnuls, Mama. Bocks. Nise! Choo choos, Jakie, tunnuls." Which means they made big tunnels with blocks at Miss. Denise's house, and that Jakie played, too. At dinner, we asked him questions about different things that happened at school, and we found out who had and had not peed or pooped on the potty. It seems small, especially when kids his age are often saying so much more, but it's a huge difference from where he was even a few months ago, at his last evaluation. It's also a glimpse of a different place in parenting, chatting with a kid over the dinner table, telling knock knock jokes and explaining how the quesadilla maker works. That's something to look forward to. I've been spending the past week thinking carefully about how I hope to act in 2014. I have a (bad?) habit of making outrageous resolutions, to the point that I build an impossible set of expectations for my year. It's not too personally damaging, because I almost always give it up a few days into January. 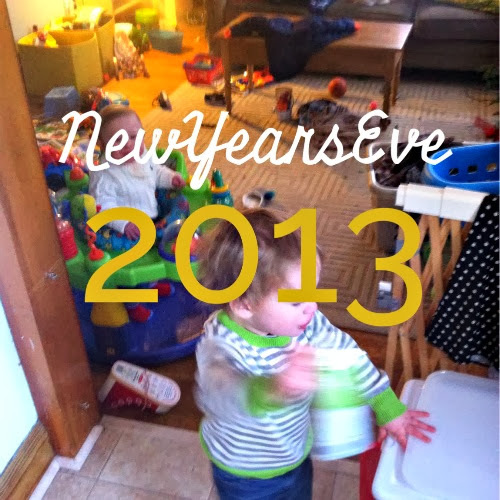 You can see some of my resolutions posts here, here, and here. This year will be different. I'm not sure if it's because I'm older, or I have a year's worth of experience with my new family of four. Maybe it's because I spent some time talking with Ben about our plans, and I'm looking for growth as a unit, instead of whirlwind reshaping my own little puzzle piece of a life. I've made some startling promises to myself that actually scare me: I promise to not calorie count in 2014. I promise not to try and restart my wardrobe by buying The Ten Classic Pieces Every Closet Needs. I promise not to join any Apartment Therapy cures. I promise not to create a system for tracking my spending. I promise to put my YEAR LONG focus in one place, and bravely leave it there. I'm not scared of giving up dieting/budgeting/home organization because I'm so good at those things and I need them to structure my life. They are my excuses. They are the crutches that let me say starting Monday, I'll...be better stronger happier cleaner prettier BETTER. Now I just have to be. 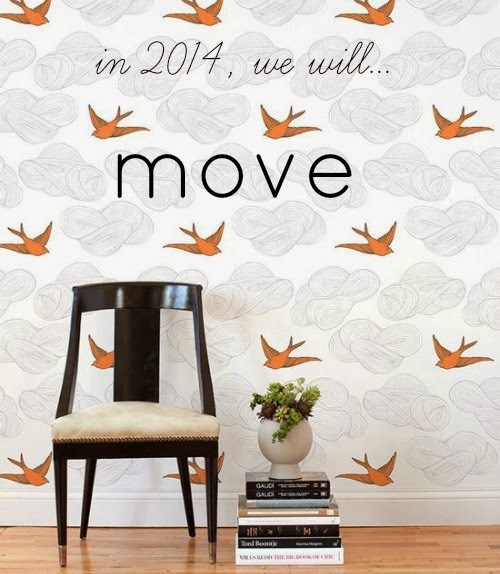 Our family's word for 2014 is Move. Ben picked it and it works perfectly. We want to move out of our house, which is scary for us because we like to put our heads in the sand and huge projects, especially where we feel out of our element, are so intimidating. But we're ready to move. We want to move our bodies more as a family. Ben has weekends off for the first time since we've had kids, and this means more family walks! Laps around the mall! Long afternoons at the playground! Maybe swimming lessons? Alone time for myself to exercise. We need to move. I've also stolen Move to inspire little lost moments. These are the five, ten, and fifteen minute chunks that might have been eaten up checking Facebook on my phone. These are the times to bang out a small task. Yesterday a grumpy Milo wanted nothing to do with me while he played in tub; I might have sat on the footstool and scrolled through Instagram, but instead I thought "move!" and I cleaned the sink and toilet, took out the bathroom trash, and put a bunch of random clutter in the hall closet where it belongs. One less task to hate myself for not doing. Move is important for our family, but I think it might take me to the next level for myself. I need to be told to move. I'm so much happier when chores are done and things are tidy, but I'm a procrastinator and will think about impending work for much longer than it would have taken me to just do it. I also find myself zoning out spectacularly, spending time rechecking social media that doesn't need immediate attention, reading about other people's lives instead of polishing mine. I need to move through easy tasks and move into the living room to stop and dance with the boys. That's our word this year. We're going to say move when we're excited and move when we're tired and we're going to move when we don't feel like it because our family needs to move, even if it's hard. We can do hard things. Last night, despite all the work I do to avoid this kind of letdown, I allowed my expectations to completely ruin New Year's Eve. To be fair, they were low expectations. I only wanted to eat Chinese food with my whole family, drink a bottle of champagne with my husband, and flip back through pictures of 2013 in order to make a slideshow or scrapbook or something. Not too demanding. But impossible. 1. New Year's Eve Chinese food orders need to be placed hours and hours early, and most places don't deliver on New Year's Eve. I had this idea that I would call in my order an hour or so before I wanted to eat and a kind delivery person would drop off steaming dinner to myself and my delighted, well-behaved children. I spent more time planning what decorative mugs I would use to float tea lights than how a realistic dinner would play out. I honestly had a picture in my head of all of us opening cookies and sharing our fortunes. ALL OF US. I PICTURED ELLIOTT DOING THIS. 2. Ben was getting out of work "early," but whenever I let that loose term become something concrete, I set myself up for disappointment. He ended up needing to make deliveries on the way home and I also asked him to pick up a bottle of champagne (something else you don't leave for 6pm on December 31st), so my idea of sitting down to eat at our normal time got pushed further and further back. 3. Milo has been weirdly, crazily sick for four or five days now. He'll go from completely exhausted and lethargic to happy and smiling to uncontrollably crying, all in a period of 20 minutes. His only real symptoms are occasional fever and lack of appetite, but his behavior has been ridiculous, especially in the evenings. Asking him to wait an extra hour for dinner, asking him to eat when he hasn't in a week...this was too much, but I refused to accept that. So then real life happened. The Chinese food order wasn't going to work out, so I defaulted to some Applebee's carside to go, because it would be easy for Ben to pick up. I know, beyond a doubt, that Applebee's carside to go is always gross. I ordered it anyway. The boys were angels until about 15 minutes before Ben was supposed to get home, and then things began to fall apart. Ben walked in on me losing my temper on a hysterically sobbing Milo. I think he wanted Mickey? Seeing Daddy helped until he realized that he had to sit at the dinner table instead of hanging out with Daddy. He went into a fit (half normal kiddo, half sick psycho) screaming "ME DOWN" until we all hated each other. Ben and I picked at our food and tried to salvage some portion of THE LAST DINNER OF 2013! At this point the candles and even real plates were abandoned and we were eating with our hands out of the take out containers. The hysterics got to be too much so we all started trying to do baths. Milo was still screaming for Mickey like it would save his life and Elliott was getting ignored. I did not help matters by literally tuning out and falling asleep on the couch. Ben wrestled the kids into bed and we argued about whether you open champagne at midnight or you can sip it all evening long. We looked around for The Three Stooges and shared 15 minutes of smiles and laughs. I fell asleep around 10 when Ben started browsing Netflix. I woke up at one point because one of the kids was crying and Ben wandered out of the their room holding a glass of champagne. "Wait, really? Did we miss it?" I think that hurt worse than waking up at one or something. I really like the countdown and seeing everybody cheer and smooching Ben. I got a text from my mom and went to brush my teeth. Ben was already asleep. I was really, really disappointed. I didn't have time to simmer in my discontent, because Milo woke up screaming and sobbing and sick. Just as Ben settled him down to sleep with us, Elliott woke up with a high fever. At least now we could rule out rabies, which was literally what I thought Milo might have. I ended up sleeping on the floor with Elliott, because both boys needed skin-to-skin contact to make it through the night. I woke up this morning, half wedged under Milo's crib, and panicked that we might have accidentally just set the tone for 2014. Then I laughed. Of course this is the tone for 2014. This is the realest of real life. No matter what Instagram or memories of my childhood or my best intentions say to the contrary, most of the time we're dealing with screaming, harried dinners, sick kids, working late, and the letdown of things not going to plan. I might ask Ben for a redo tonight. It will be much easier to procure Chinese food, and we could put the kids to bed on time to avoid a cage match over pajamas. Or maybe I'll just move on through the new year, remembering that our family isn't defined by how we celebrate holidays, but how we handle the day to day. Here's to keeping it real in 2014.